BOOMERANG CLASSIC is very effective for classical defence. It allows a lot of backspin together with precise control. Even powerful topspin shots can be returned with a chop which generates a flat flight path.The rubber provides a decisive disruptive effect because the ball will tend to stay low after the bounce. Furthermore BOOMERANG CLASSIC enables a player to neutralise the opponent's spin by either short passive blocking or faster aggressive blocking. With either shot the ball will be returned without any spin (a float effect), thus often causing the opponent to lift the next shot off the table. Counter-attacking can also be performed very easily. Even flat counter-hitting of the opponent's chopped balls is possible. BOOMERANG CLASSIC is a perfect choice for players who like to use a mainly chop defence, but with occasional surprise attacks. 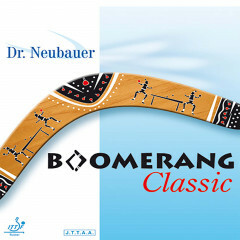 Dr. Neubauer Rubber Boomerang Classic is beeing added to cart.